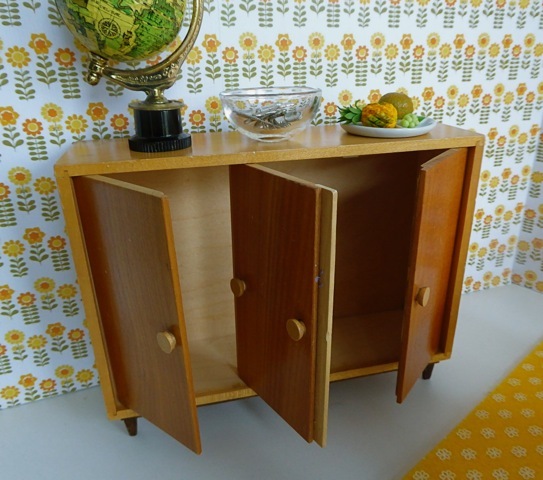 SIDEBOARD: A high quality, mid century piece from Germany, we believe. This is a solid piece, in good condition, with the thin tapered legs, so characteristic of mid-twentieth century furniture. The sideboard has triple opening doors, perfect storing everything a doll’s dining room could want. In fact, there’s an ecru linen tablecloth inside, all ready for more formal meals. On top, sits a globe, a glass fruit basket and a white ceramic plate holding a pineapple, grapes and guava (please see the close-up photo). TABLE: Another high quality, mid century piece by Strombecker, from America. 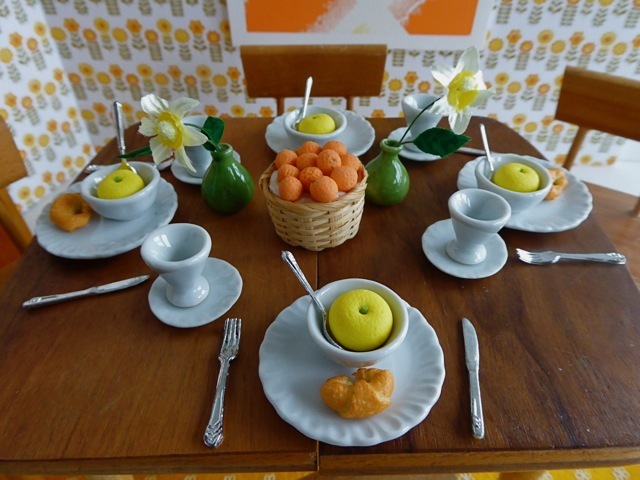 The table itself is set for breakfast with croissants and grapefruit on a complete set of white ceramics: four large plates, four small plates, four bowls, four beakers, plus silvery cutlery for four dolls stored in a large glass bowl. In addition, two green ceramic vases hold fake daffodils. CHAIRS: A lovely set of four wooden chairs, again of American manufacture from Strombecker. PAINTING: A modern print mounted on thick foamboard. 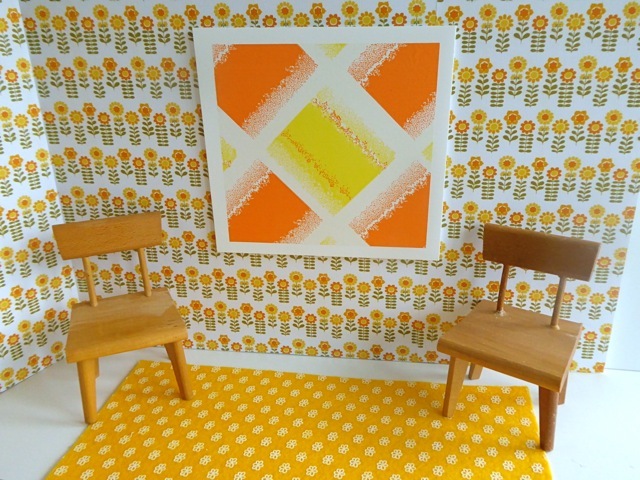 RUG: A piece of modern felt – plain on one side, and printed with daisy shapes on the other. 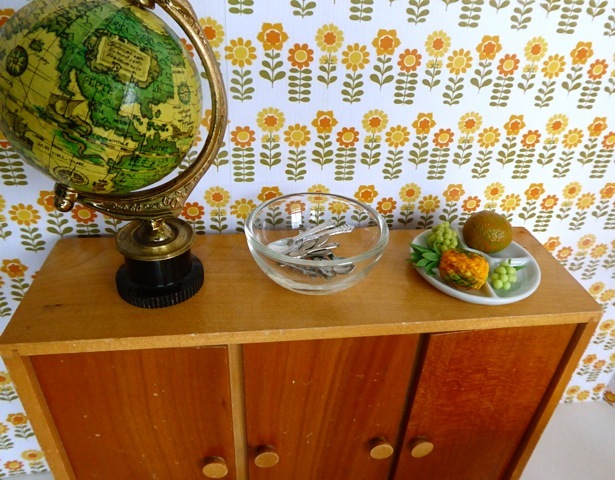 WALLS: Covered in 60’s patterned paper, in the citrus colours so popular at this time. The paper has been mounted on two pieces of 5mm thick, A3 foam board. Each piece of foam board measures 42x29.5cm or 11 5/8 x 16 3/8in. 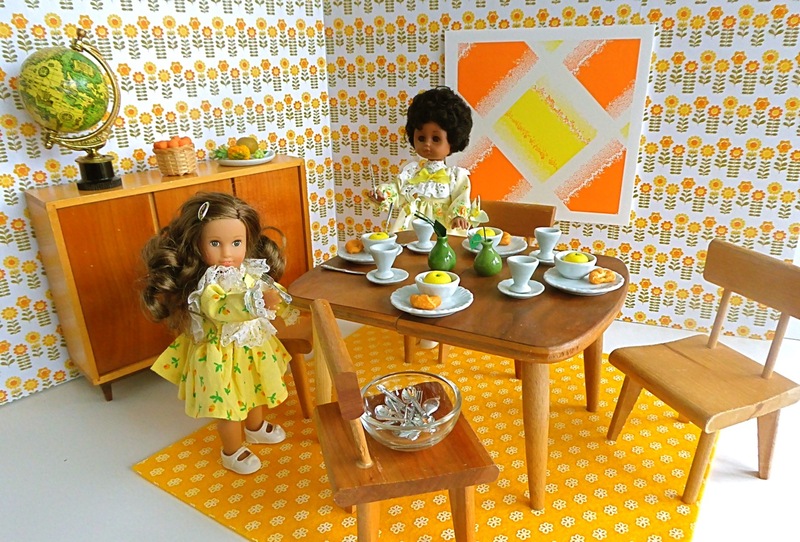 DOLLS: Chosen from our selection of vintage dolls, but please see the DOLLS section of our website for a larger choice. Shown here: a mini American Girl doll on the left, and a brunette Lesney Ginny doll, on the right, both wearing vintage Ginny clothing. Note that there are lots of other clothes available for all these dolls – please see the CLOTHING section of our website.